This is the same 100% stainless steel Hop Stopper we use to filter hops and hot break material from our Boil Kettle. We've been using it for years and it is highly effective. Extract every last drop of wort! 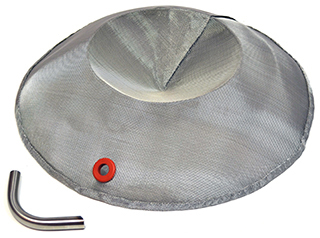 It's a large stainless steel mesh screen that covers a dip tube that extends down to the bottom of the kettle. The bottom of the dip tube is notched such that wort flows into it from all sides. It's all stainless steel with a silicone grommet which means it is easier to clean, stronger, and holds up better over the years to contact with acidic liquids such as beer. Stop using inefficient bags, tea balls, or hop spiders which limit hop utilization - let your hops roam free! The new Hop Stopper 2.0 is the best Boil Kettle hop filter we've ever used! Version 2.0 has been completely revamped and updated to maximize hop and hot break filtration while saving time. No recirculation required, no settling time required, no whirlpool required. Start draining immediately after the boil to better lock in those bright late addition hop flavours. Hop Stoppers are available for any kettle type! Update: As of May 8, 2018 the original Hop Stopper has been discontinued, replaced by the ultimate hop filter: The Hop Stopper 2.0! Greatly improved performance that allows for recirculation and no slowing down near the end of chilling, allowing for the fastest possible chill to lock in those late addition hop flavours. Available exclusively at TheElectricBrewery.com. Note that a week or two after launch of v2 I removed some comments/discussions in this thread about the original v1 Hop Stopper as I realized someone would think that the comments were directed at v2 instead of v1, which would cause confusion. I probably should have started a separate thread about v2 instead of updating this post - oops! After a year of testing and trials (and lots of beer), we're proud to introduce the ultimate hop filter: The Hop Stopper 2.0! Greatly improved performance and faster chilling to lock in those late addition hop flavours. P.S. I've removed a page or two of discussions and comments about the original Hop Stopper (1.0) as it's going to cause confusion for anyone coming here looking for information on the new completely redesigned v2.0. This Hop Stopper 2.0 looks great! What is the height of the Hop Stopper 2.0, both for the Standard as well as the XL and what clearance do you need for both versions? I came here to ask the same question! Great looking product. The standard is 2" high while the XL is 3" high. This was from my measuring, but I'm reached out the manufacturer to confirm as there's going to be some subtle play from one version to the next as they're flexible (which in turn means that it isn't overly critical - no issues with it touching the heating element either). - What sizes of Hop Stopper 2.0 are available? - What size do I need? What is the maximum amount of hops the Hop Stopper 2.0 can handle? 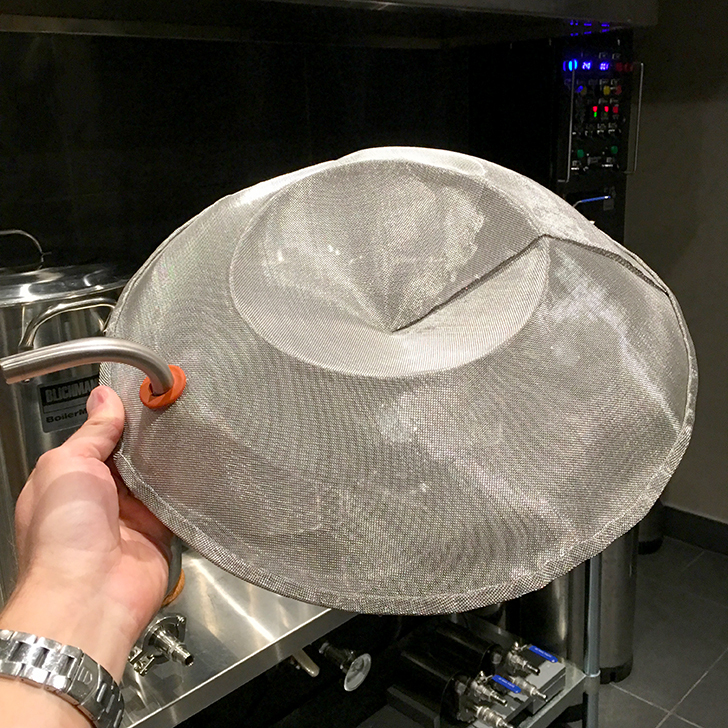 Note: While your kettle may be able to accommodate the 14.25" diameter size of the Hop Stopper 2.0 XL, be sure to take into account other items installed in your boil kettle such as heating elements which may make it difficult to maneuver the Hop Stopper 2.0 XL into place. For example, our Blichmann 20 gallon kettle with a heating element will not accept the Hop Stopper 2.0 XL even though the overall diameter of the kettle is nearly 18" and we have enough clearance below the heating element as there isn't enough room to maneuver the Hop Stopper 2.0 XL into position. Our heating element is centered 4" from the bottom so it would have to higher for the XL to fit. No concerns here as the standard sized Hop Stopper 2.0 provides excellent filtering for even heavily hop loaded beers. So I'm not sure exactly how much clearance you need to make an XL fit as it'll depend on the kettle diameter, the heating element type (straight vs ripple), the heating element height, the heating element position, and anything else you may have in the kettle that may get in the way. It's not something that can be easily calculated. Ironically, I can get the XL into my 20 gallon kettle with a ripple element centered 4" from the bottom... as long as I install it upside down. (Which doesn't work of course). This is because of how the top of the Hop Stopper 2.0 is curved which keeps the widest part of farther away from the heating element as you slide it into position. I can get it in the right side too given that the Hop Stopper 2.0 is somewhat flexible, but I don't like bending it. I could also bend the heating element towards the front more to give me enough soon, but as mentioned above, there's absolutely no need for the XL in a 20 gallon kettle. Over the last year I've thrown a massive amount of hops at my 'standard' version and it works great! Slight correction noted above: The manufacturer indicated that the standard is 2" high while the XL is 3" high. I've updated the order page. Dennis Collins here from Innovative Homebrew Solutions. I'm thrilled to be working exclusively with The Electric Brewery to offer the completely redesigned Hop Stopper 2.0. Based on testing, trial and error (lots of error), and most of all, feedback from all of you in the brewing community, I think the new 2.0 design will offer a vast improvement to your brewing. I'll be subscribed to this thread so that you can ask questions about the product and I'll try to be as complete and informative on the answers that I can be. Home of the Hop Stopper 2.0! Well, I'll probably be ordering one soon for my keggle. But I need to measure, and check my inventory. I probably have some pieces of 1/2" tubing still around from my initial build, and hopefully I have an extra 1/2" tubing to 1/2" male NPT fitting. $30 more that? IMHO, yikes. I see I can order one for around $20, but it probably isn't worth doing so on its own, with shipping, etc. Update: Found a local source for the fitting, ~$13 all in. Everything is all stainless steel (except for the grommet which is FDA silicone) and the dip tube is custom made to each individual kettle. If you make your own dip tube, make sure it reaches to the center of the converted keg bottom and comes very close to the bottom surface for maximum draining. Also, the dip tube needs a notch on the tip to assure that wort can always flow into the dip tube. Download the User's Guide on the Hop Stopper order page and check the bottom of Page 2. I have used version 2.0 twice now. Quick background. I was a version 1.0 user but had mixed results. I stopped using it for a www.brewershardware.com wort strainer (their original version). Using it before the pump worked well but would fill (clog) on very hoppy beers. I moved it to after the pump as they more recently recommend and it barely caught anything resulting in a ton of trub and hops in the fermenter. I have brewed twice with hop stopper 2.0. First batch was 10 oz of whole hops in the 20g kettle. Second batch was a ~6 oz pellet hops batch. In both cases, version 2.0 worked absolutely perfectly. I could not believe how dry the pellet hops were with very little if any wort left behind. I did not slow the wort transfer down at all, and I can chill at a pretty crisp pace. Cleanup was easy. Tip: have a powerful sprayer and don't stop until the inside is totallyl clean. Stuff that does end up inside and dries can be difficult to remove later. In summary, version 2.0 is absolutely a joy to use and functions perfectly for me. Great work and a no brainer purchase in my mind. Excellent! Glad you're enjoying the Hop Stopper 2.0 mvakoc! Got my Hop Stopper 2.0 today and it looks like a great unit. I'm planning on doing a Kolsch next and I bet it won't even bat an eye. Enjoy! Please do let us know how it goes. I brewed a Kolsch myself with the Hop Stopper 2.0 about a month ago and it was smooth sailing.... Super-fast chilling (12 gallons from boiling down to close to pitch temp in 15 mins). doing a belgian wit tomorrow, i'll let everyone know how it goes. only four ounces of hops in the batch but there is also four ounces of orange peel/coriander but i'm not worried about it. what i am most excited to try is recirc through my plate heat exchanger for the last 10-15 min of the boil, for sanitizing purposes. in the past, i would run off the first wort after boil through the chiller to drain until it hit over 160 degrees in the exchanger and then hold for 10 min or so. no problems so far but recirc with boiling will have me feeling a lot better. Keep the flow rate below (approx) 1 GPM and you'll be fine. Good luck! If you're looking to sterilize, the times are longer. daaaaamn, that Hop Stopper 2.0 is awesome. ran a constant flow out of the bk, as fast as i could go, based on my cooling water temp. hose from bk to pump drained, closed the valve, ran it for another minute cracked open, got maybe another pinit out of it. and that was it, i literally couldn't get any more volume out of the bk since there was nothing left! Great! Glad to hear you're liking it! I find it's a real game changer! Anybody running the 2.0XL with an 1/8th hp pump?